This is one of those recipes I’ve had for a while (like since early fall), but just never got to posting. No better day for posting a delayed pie posting than Pi Day (3.14). The fruit called for in this recipe is a fall combination. However, this recipe has been tested and approved with other great combinations that span more seasonings. The best are apple cranberry and apple blackberry. Really, you can use your imagine to get your seasonally available mix. All of this fresh snow is making me crave things flavored with mulling spices. This is a perfect solution – some late season blackberries I flash froze from last fall, Gala apples, and ginger molasses cookie topping. I enjoy making all the components of the recipe from scratch (apple cider, pie crust, and cookies). Included in the recipe below are links to my favorite recipes for each of these items. The cider is particularly enjoyable to make from scratch as it simmer for 3 hours and makes the home smell amazing. These are all things that can be bought for a quick baking solution. Happy Pi Day. I hope you have a chance to make pie real soon. Please tag us on social media to share photos of your pie results. We would love to see what you are making. Apple cider infused persimmon and cranberries on an all butter crust - soft beneath and crispy, flaked on the edges. Top off the coziness with a ginger molasses cookie crumb. Place the persimmons, cranberries, 1 ½ cups apple cider, sugar, cinnamon, and nutmeg in a saucepan. Heat the mixture over medium-low heat until the cranberries pop/split. In a small bowl, mix the cornstarch into the remaining ¼ cup of cider. Add the starch/cider combination to the pan of ingredients. Stir everything until it has thickened. Remove the pan from heat and set aside to cool while preparing the topping and crust. While filling is cooling, place ingredients for the crumb topping in a medium bowl. Mix until it forms a crumb like texture. Set aside. Roll out the pie crust and place in pie dish. Once fruit mixture has mostly cooled, pour it into the pan lined with the pie crust. Trim and prepare the edges of the crust as desired. I just crimped the edges on mine. Distribute the crumb topping evenly over the filling. Bake the pie for 30-40 minutes at 400 degrees F. Place a baking sheet on the rack below the pie to catch any pie drippings. When done, the filling should be bubbly. Cover the edges of the crust with foil if they start to brown before the pie filling is baked through. I was in Missouri for the first time. It was by accident. We were returning from Iowa, driving back into Chicago. There must have been a patch of highway without network connection and the phone maps dropped. My husband and I were in deep conversation and did not notice until he saw the “Welcome to Missouri” road sign. We easily added two hours to that trip. As we drove back the correct direction, I noticed a scenic area with a river running and rustic homes. I recall a sign for Lost River. I am hoping to look up more information about the place because it was beautiful. This got me thinking more about perspective. Sometime our destination becomes so important to us that we ignore the meaning in the journey. Tomorrow night is my final presentation for my master’s degree. It is a fantastic destination, reaching this milestone. I would miss out on a lot if I did not recognize the journey that has gotten me here – especially the time spent staying at home with the boys while completing my studies. Time with the little boys is wild, lively, and demands a constant state of remaining in the present. Respecting all of this experience, I cannot find a way to separate the journey of studying, being present with my boys, and completing this degree. My time with the boys has been my lost river – my expected journey. Back to the reason we were on the road to begin with, we had just visited my in-laws. My other mom is the one who gifted me the adorable bee themed honey pot from the pictures in this post. The recipe I am sharing with you today is for fry bread. This is a treat that my great-grandmother would make for us, and later my mother. It is a quick bread recipe that finds it’s origins and broad use in Native American cooking. The dough is fried and then covered in sweet or savory toppings. As a child, I usually enjoyed these covered in melted butter and granulated sugar. Recently, I have made them for my family to cover with chili, tacos, or jam and honey. 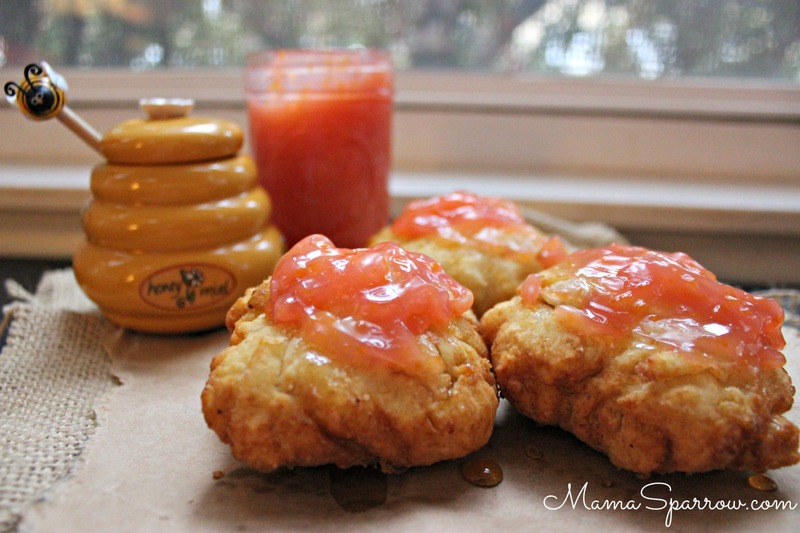 In these pictures, the bread is covered with vegan orange curd and drizzled with honey. Below is the recipe. The base recipe for these is vegan and can be topped with a variety of vegan sweet and savory options, as well. Fry bread with a slight crisp to the outside and tender inside. This quick bread is fantastically versatile. Top with your choice of sweet or savory - taco, chili, honey, jam, curd...it's up to you. Fill a skillet with enough oil for the bread to not touch the bottom of the pan. Turn oven to medium high heat. Mix dry ingredient. Make a well in the center and slowly add the water. You many not use all the water, just add enough to get a shaggy dough. Mix until well combined with a wooden spoon. Let the dough rest for 2 minutes. Separate the dough into 8 pieces onto a floured surface. Sprinkle flour over the dough and form to a thick circle. Don’t overwork the dough. Place the dough, one at a time into the pan setting them away from yourself so as to splash the oil. Cook 2 minutes on each side. If you have space, you could cook 2-3 at a time. Place cooked bread onto a rack to allow excess oil to drain. Add toppings while the dough is warm. One of the fantastic things about living in the city is accessibility to rich cultural experiences. Yesterday, we had a family trip to the Chicago Cultural Center to attend the Chinese New Year Celebration. It was a beautiful display of dance, martial arts, and music. No surprise, the boys were very taken with the dragon dance and martial arts dancing. There was much reenactment throughout the rest of the afternoon. I can now claim the skill of reading textbooks while chanting a drum rhythm. Today, as we enjoyed a snack of vegan blood orange curd spread on fresh baked biscuits, we recounted our favorite parts of the performances yesterday. The tales were movement filled. The snack was well accented with the subtly sweet orange curd. This curd spread was silkier in mouth feel than the creaminess of an egg and butter version. It a delightful, lighter alternative to traditional curd. 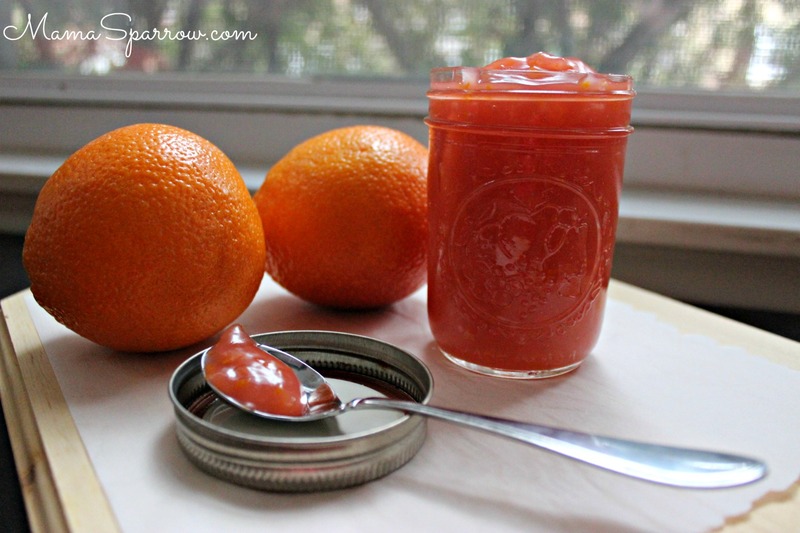 This last round I used blood oranges and the color of the cream is so lovely. The process is rather simple. Slice and juice your citrus. Reduce the juice to heighten the flavor. Zest in an orange peel to get a hint of sweet, floral aspect. Then sweeten with your choice of sweetener. In a measuring cup, dissolve cornstarch in cold milk before adding to the juice. Warning: be vigilant while stirring because the cream will thicken very quickly. Once it does, it ready to remove from heat, cool, and store or use immediately. Curd is a multi functional spread that is delicious on biscuits, cookies, crepes, cakes, and more. Even by the spoonful, no judging here. Hope you have a chance to try this recipe soon. I’d love to see the results. Be sure to tag MamaSparrow on social media. Silky vegan orange curd. Flecked with the subtle floral sweetness of orange zest. Curd is a multi functional spread that is delicious on biscuits, cookies, crepes, cakes, and more. In a small saucepan, over medium-low heat, reduce the orange juice to about half the volume. While the juice is reducing, measure the milk in a liquid measuring cup. Whisk the cornstarch in the milk till it dissolves. Set aside. Once the juice is reduced, add in the sugar and zest. Stir just until the sugar dissolves. Add the milk mixture to the saucepan and use a spatula to mix. Keep on medium-low heat and mix constantly until the texture thickens quickly. If the mixture starts to bubble before thickening, reduce the heat slightly. Once it does thicken, it will be very sudden so stay with you pan. Once the mixture is thickened remove from heat and allow to cool enough to store in a jar or use immediately. Curd will store in the refrigerator for 1 week or freezer for 3 months. Some settling will occur, give the curd a stir to re-incorporate separating liquids. I’ve been a bit quiet on the internet front as I’ve been enjoying time with family over the holidays. It was nice to have a break from grad school classes and a chance to spend time with people who are dear to me. One week during the holidays was particularly notable. I got a chance to meet both my new nephews born during that week. It was an incredible honor to be present at one of their births. There is nothing else in the world like the experience or witnessing of childbirth. Overall the week we went to Minnesota was family filled as I got to visit with my parents, my sister and her family, and my brother visiting from out of the country military service. Since we’ve been back home, the boys have been making pretend road trips to see family. It’s been adorable, but also means all my reusable shopping bags are constantly filled with books and toys. Speaking of family, this recipe is an adaptation of a family recipe I grew up with. These muffins are like a winter hope. Oranges get so tasty by Christmas. The tang of prime citrus is like rays of sun promising summer warmth. While nature bides her time in the quiet rest of winter, I’ll stay here wrapped up a blanket with fresh baked goodies and a hot cup of tea. Consider the baking and enjoyment of these muffins part of your winter therapy. The aromatic of orange zest will melt your stress and help you feel energized. Additionally, the studs of chocolate chips throughout these tender wheat muffins will give you an extra mood boost. 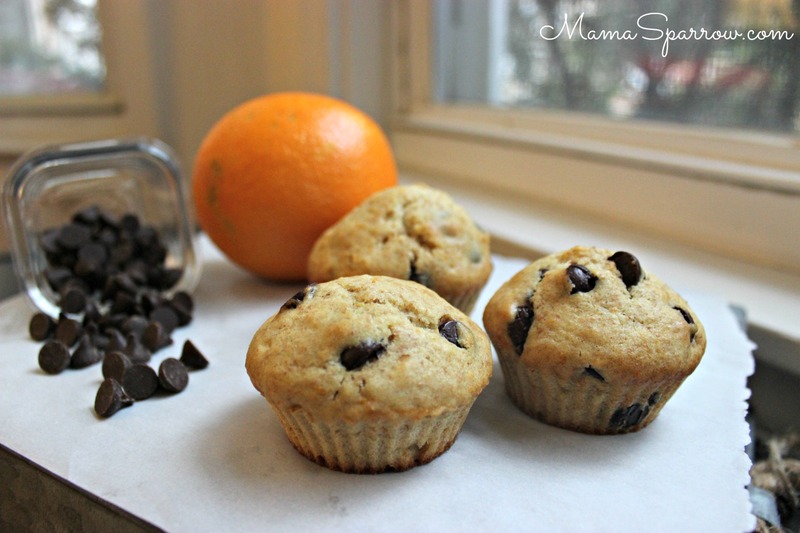 Tender wheat muffins with zesty orange and tasty surprises of semi-sweet chocolate chips throughout. These muffins are reminiscent of winter-y days of childhood. Preheat the oven to 400 degrees F. Prepare a muffin tin with liners or silicone muffin cups. Mix everything together except the chocolate chips and orange zest. Fold in the chocolate and zest. Fill muffin cups to ⅔ full. Bake for 20-25 minutes or until golden brown. This is a recipe that has been handed down from my great grandmother. It is not Christmas in our family until these cookies are baking in the oven. My best memories of these cookies are their required presence the day our family decorated the Christmas tree. The Christmas album would be queued up, cups of hot chocolate prepared, and a plate of these cookies. This tradition I have carried on with my own family. The copy of the recipe I have in my recipe box calls for margarine sticks. We use unsalted butter. Feel free to make which ever way you prefer. The results are much the same. The butter version requires re-chilling before going in the oven to maintain shape and reduce the spreading from the oven. The recipe yield is entirely approximated. Much dough sampling and cookie sampling happens before I have the chance to determine how many cookies are made each time. Grab yourself a cup of hot chocolate to enjoy with these. Just try to save a few for Santa. Hope you get a chance to make these soon. We would love to see the results. Share on social media and tag Mama Sparrow so we can see. In a large mixing bowl, cream the first 5 ingredients together. Then add the baking soda, cream of tartar, salt, and vanilla. Finally, mix in the flour 1 cup at a time. Chill in refrigerator and then roll into ball and roll in sugar and then press out with a fancy glass bottom. Refrigerate 5 minutes before baking so cookies keep their shape. Bake at 350 degrees F for 8-12 minutes. Crisp sugar cookie with a slightly tender inside. Each bite melts in the mouth. Grab a cup of hot chocolate, tea, or coffee. Just be sure to save a few for Santa. A few weeks ago, I began the recipe testing and planning for Thanksgiving. My preschooler came home from class singing a song about pumpkins on a gate. A witch flies by and says. “I’m going to make you a pumpkin pie.” My son requested a pumpkin pie making session inspired by this song. Agreeably, the pie making was a blast, but he did not enjoy the taste of it. I’ve been adjusting the recipe and he’s been liking it better, but asked for this pumpkin cake for Thanksgiving dessert. This cake is a great replacement for anyone not into pie or who had been “pied out.” Use of your leftover pumpkin gourds or puree for a tasty bite of sweet and spice. Enjoy this cake with your choice of cold weather beverage. The ingredients are vegan and icing is naturally colored from carrot juice. If you want the complete pumpkin cake look, bake a single cupcake with part of the batter. 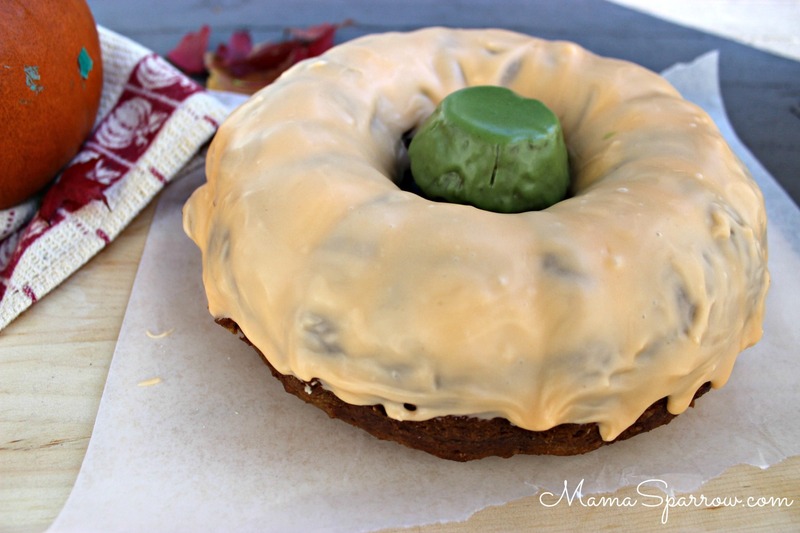 Use spinach cooked and pureed to achieve a green colored icing. Spinach is the mildest tasting leafy green for creating a natural food hue that does not interfere with taste. Hope your Thanksgiving and harvest celebrations have been filled with joy. Please be sure to share your results from this recipe and tag Mama Sparrow so we can see it. Tender, moist vegan pumpkin cake. Pleasantly spiced with a little extra kick of black pepper. This makes it really stand out from the usual pumpkin spiced products of the season. Preheat oven to 350 degrees. Lightly oil a standard size bundt pan. In a medium bowl, combine the flour, baking powder, baking soda and salt. Stir to combine and set aside. In a large mixing bowl, mix the sugar and oil together. Add the pumpkin puree, non-dairy, vinegar, and vanilla extract. Fully combine. Sift the dry flour mix into the wet ingredients in 2 stages. Stir in between each addition. Careful not to overmix. Pour the cake batter into the prepared bundt pan. Bake for 50-60 minutes. Allow cake to cool slightly, remove from pan and finish cooling before icing. Mix ingredients together for icing. Adjust the wet to dry ratio based on preference. Drizzle over cake and allow to set a few minutes before cutting and serving. Do you know why we perceived October to have a distinct smell? There are three reasons for this phenomenon. According to Pamela Dalton, an olfactory scientist at the Monell Chemical Senses Center in Philadelphia. the first reason is that odor molecules move more slowly in colder temperatures. This is why the smell of dumpsters and garbage trucks are more offensive in the summer. The second reason is physiological. Dalton explains that our olfactory receptors “bury” themselves further in our nose when it’s cooler. While the olfactory receptors bury themselves in cold air, the trigeminal nerve is stimulated, says Alan Hirsch, a neurologist and psychiatrist in Chicago. A smell is perceived as more intense when it triggers both these nerves. Further, psychological expectations affect the smells we perceive. As we anticipate the smells of spices, wood burning, and dying leaves, those are the things we experience. A week ago, we took a family trip to a local nature center. Living in a city, it is nice to have a nature area with trails and wildlife near by. The boys enjoyed running around the trails to explore. Changing autumn leaves made for a lovely scene. We got the chance to have a close encounter with the deer in the park again. This time I was prepared with at least a phone camera. She watched us from a few yards off the pathway. The autumn has a distinct smell that I had forgotten until we were out on the trails. In the city, leaves are quickly cleaned up and discarded. Out in the woods, they are free to travel through their life cycle. The smell is crisp, rich and earthy. I now appreciate this sensory experience. Spices are more prevalent in traditional colder weather baking. 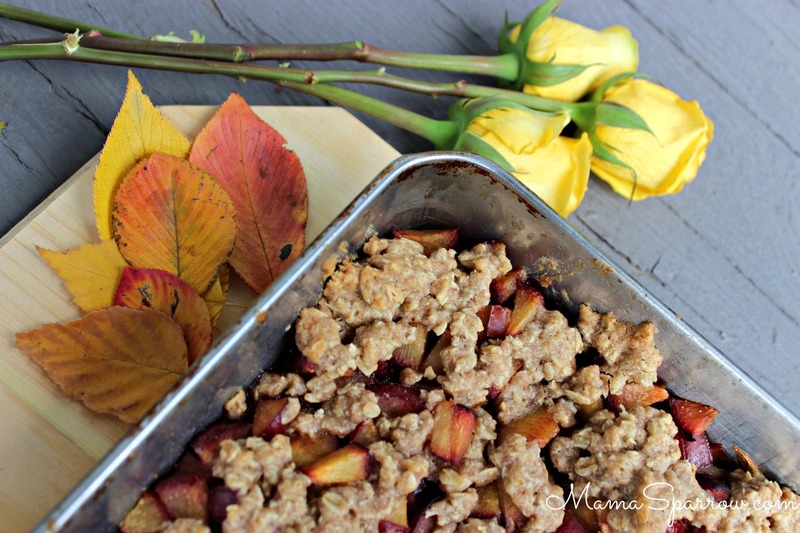 Today’s recipe combines late season plums with spices, maple and toasted oatmeal crumble topping. This recipe has a clean option as coconut oil can be subbed for the butter and there is no refined sugar or refined flour. The warmth of maple, spices and subtle floral sweetness of plums is a welcome treat on a crisp fall day. 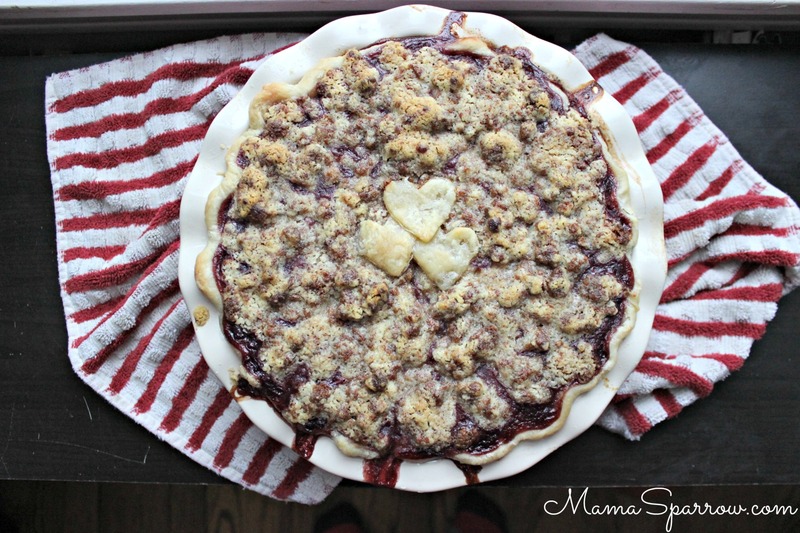 This crisp would be perfect for a quick harvest party dessert or a weeknight treat. I’d love to see your pictures when you make this recipe. Share them on social media with MamaSparrow tagged. Happy baking! The warmth of maple, spices and subtle floral sweetness of plums is a welcome treat on a crisp fall day. Preheat the oven to 350F. Peel, core and thinly slice the plums. Place the prepared plums in a 2 quart baking dish or 9x9 inch metal pan. Add the 1 1/2 Tb of maple syrup and 1 Tb of flour, stir till fruit is evenly coated. Sprinkle the fruit with the ginger. In a medium bowl, combine the 1/2 cup flour, rolled oats and salt. Cut the cold butter into the oat mix. Stir in the 1/4 cup maple syrup. With hands, crumble the oat mix evenly over the pan of fruit. Let cool for 5 minutes. May serve warm or cold. If your crisp survives past dessert, it makes a great breakfast the next day. *Clean or Vegan option: substitute coconut oil for the butter. This week we took the boys for the annual pumpkin farm trip. We arrive filled with excitement and took away some great pictures, a few pumpkins and endless family fall memories. C named his freshly carved jack-o-lantern Rooster. I’m not sure how this pet name came to be. He’s been telling us that one day when he gets a dog he wants to name it Rooster. Until then, a jack-o-lantern with the name will do. Other than the lovely autumn festivities, fall usually means a brief mourning period for me. I know some folks enjoy this season. I love warm summer weather and don’t much care for the cold months of the year. This season only serves as a reminder of the impending winter. We have had some cold autumn rain that has sapped my energy. If you are like me this cake recipe is dedicated to you. Cold rainy autumn weather makes me need a little bit of citrus-y sunshine treat. 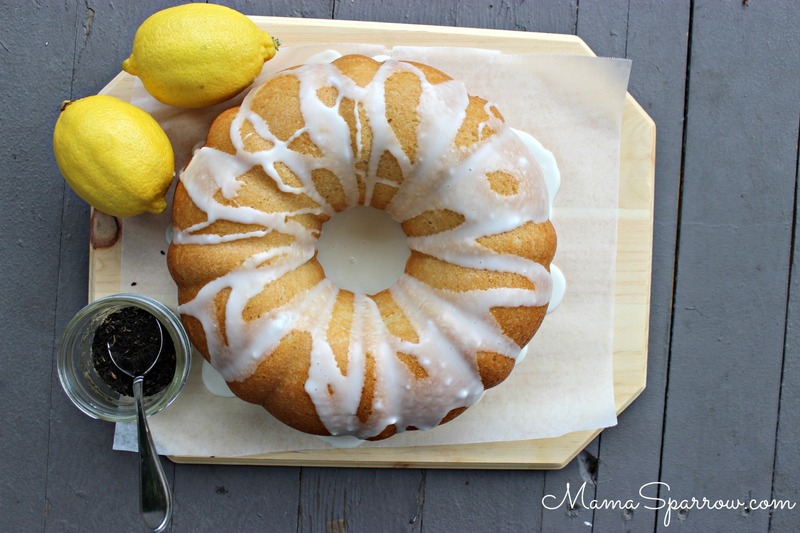 This lemon earl grey cake is the most tender, moist vegan cake thanks to the shredded coconut. Infusing the coconut oil with earl grey lets the richness of the bergamot shine through to compliment the lemon. I hope you have the chance to enjoy the intoxicating aroma of this cake coming fresh from the oven. Please be sure to tag MamaSparrow on your social media pictures of this cake. I would love to see how your’s turns out. The aroma of this cake coming out of the oven is intoxicating - bergamot, lemon and coconut. Hard to believe this treat is vegan. Tender, moist cake infused with earl grey. In a large mixing bowl, cream the sugar and tea infused oil together. Stir in the lemon zest and ¼ cup lemon juice. Set the rest of the lemon juice aside for the glaze. Add the coconut milk, non-dairy “buttermilk”, and vanilla extract. Fully combine. Sift the dry flour mix into the wet ingredients in 2 stages. Stir in between each addition. Careful not to overmix. Once the mix is fully incorporated, fold in the shredded coconut. Cake may be store at room temperature for a few days or in the freezer for 6 months. In a saucepan, melt coconut oil just until it becomes liquid. Mix in the tea leaves. Keep on low heat for about 5 minutes. Remove from heat and allow to stand for 5 minutes. Strain the mixture through a fine sieve squeezing the tea leaves to release as much butter as possible. Set coconut oil aside till it comes to room temperature. If your kitchen is warm it may be helpful to put it in the refrigerator, briefly, till it is solid. **I’ve been using Good Karma flax milk. It is a great allergen conscious milk - nut and soy free. Use your favorite nondairy that suits your needs. Make as buttermilk with vinegar to help cake fluff up. Recently, my little ones and I had an opportunity to travel and see family. Time with loved ones is cherished and seems to pass too quickly. While visiting, I made an observation. There are several trees in my folk’s yard that we planted as children. My favorites are the willow trees. This visit, they displayed noticeable growth indicative of trees, no longer saplings. Since I have not stayed long enough in one place the last 10 years to observe nature’s progression, this observation of the trees was an impactful experience. I was struck with an awe of nature’s cadence. Well into adulthood, the marching of seasons has taken on the perspective of occurring at a rapid pace. The ripple of years has become a more visible breathing of nature. The rough intricacies of nature’s pattern provide a certain comfort and joy – perpetual and dependable. While on the journey of eating fewer processed foods, I’ve been more attentive to what the earth provides in seasons. Eating the bounty of each season draws us into the cadence of Mother Earth. There is something deeply beautiful about this concept.Conscious eating is an extension of conscious living. Peaches are rich with flavor, right now. This tart was inspired by my hope of making berry jam from the fleeting summer supply. The smashed raspberry layer is reminiscent of jam. No refined sugar here, the fruit layers are sweetened with honey. Topping with sliced peaches allows the star of the dessert to shine. These peaches were bursting with flavor. I will leave you with the encouragement to live present, playful and peaceful days. Hopefully your present or near future will include enjoying late summer harvests that bring you true bliss. If you get the chance to make this tart, be sure to drop me a line and share your results on social media with MamaSparrow tagged. 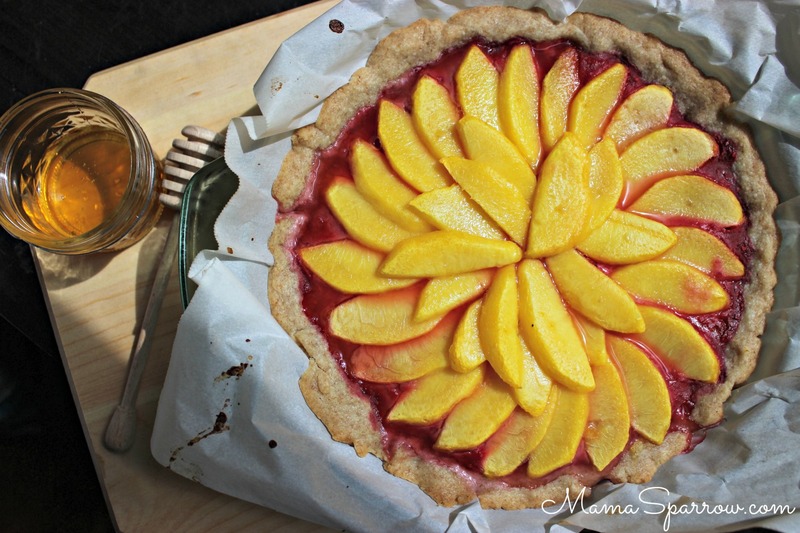 Wheat shortcrust with fresh smashed raspberries and honey drizzled prime season peaches. Enjoying the late season berry bounty, this tart is summer on a plate. Mix together the flours and powdered sugar. Slowly add in the butter while mixing. Use a pastry blender or a stand mixer fitted with a paddle. Blend until the dough forms together. Press the dough out by hand in a 9 inch round pie pan lined with parchment paper or tart pan. Sometime I like to make rustic free-hand formed tarts. Use fork to prick several holes in the bottom of the crust that will be covered with filling later. Place pressed out crust into the refrigerator for 5 minutes to help the butter in the crust keep shape. Bake the crust alone for 15 minutes or until crust is firm on the outside and slightly puffed. Place ingredients for berry layer in a small bowl, mixing them together. Set the bowl aside while slicing the peaches. Turn oven down to 350 degrees F. Spread the berry layer evenly over the prebaked crust. Arrange the peach slices over the berry layer. Bake the tart for 25 minutes or until the peaches are fork tender. Drizzle honey over the tart while still warm. Enjoy either warm or room temperature. Store at room temperature for a day or a couple of weeks in the freezer. I have a spicy confession to make. Are you ready for it? Cardamom spice is my new love. It has been added to most of the baked goods I’ve made the last few months. Anyhow…the weather has been so hot and humid lately that today’s moderate weather felt surprising. We also spotted some fallen leaves this afternoon. Gasp. I cannot believe that summer has so quickly neared the end. 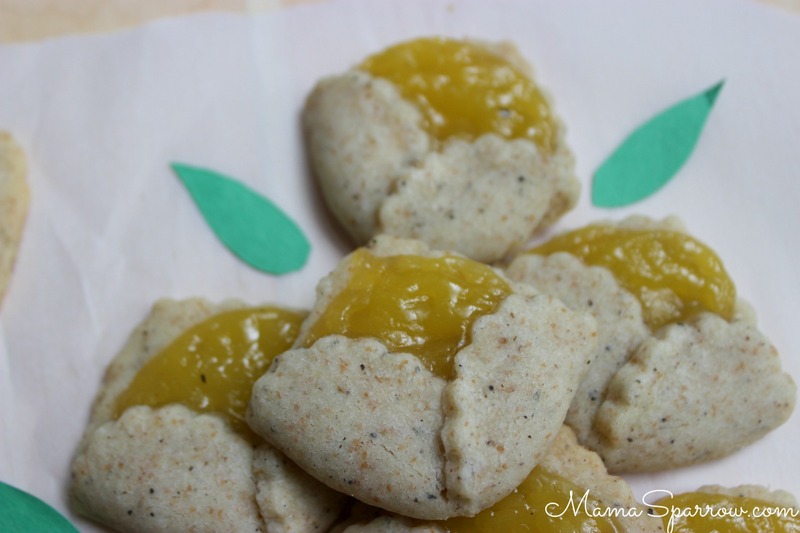 Because I am not ready for this change in seasons, I am sharing a blooming cookie recipe with you. These spiced shortbreads with earl grey cream were one of those happy kitchen accidents. I tossed some spice in my cookies. While prepping the cookies I was savoring a spoon of lemon earl grey cream. The flavors were perfect together, these cookies were born and I am urging to make a batch this weekend. In fact, don’t even wait till the weekend. Drop everything and run to the kitchen now. Then be sure to drop me a line and share your results on social media with MamaSparrow tagged. 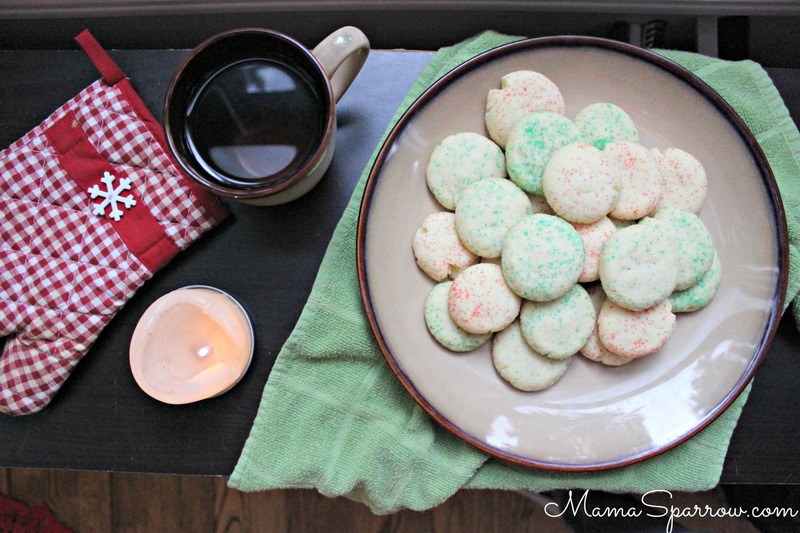 Peppery butter cookies with cardamom deepened flavor - hint of honeyed floral. In a medium bowl, cream the butter with the first 3 Tbs of granulated sugar. Blend in the vanilla extract, black pepper, and cardamom. Mix in all the flour just until dough forms. Use hands to form dough into a log shape. Cover or wrap the dough and chill in refrigerator for at least 30 minutes. Once dough has chilled you can either cut cookie rounds directly from the cookie log or roll the dough out with a rolling pin and cut with a cookie cutter. Place cookies 1-2 inches apart on an ungreased baking sheet. Bake cookies for 10-15 minutes just until they set. Allow to brown lightly on the edges. Tips for Cutting Cookies Log cut: if dough is firm enough, simply cut with a butter knife creating 1/4 inch thick cookie rounds. If dough is on the softer side, use a 6 inch piece of plain dental floss to cut the rounds. Slide the floss under the log about 1/4 inch in from the end. Grip each end of the floss. Cross your hands in opposite directions over the dough to create a "cut." Repeat until all dough has been cut into cookie discs.